As a woman who loves golf (and writing about it), I can’t begin to understand why more women don’t play this wonderful game. Yes, I’ve heard the typical answers about women being too busy juggling work and family, but hey…men have work and family too and they don’t seem to have that problem. No, it’s got to be more than that. I really want to encourage more women to play golf so I decided I’d chat with other golfers who love the game and find out what they think about this issue and what they think could be done to add more X chromosomes to the fairways. Why do you love golf? So “a select few” obviously love this game. Why don’t more women feel like we do? Patricia: “A number of things: The culture of the sport is male, and golf courses, ranges and clubhouses are still male dominated. Many women don’t feel comfortable in male dominated environments so they dont start. Then there’s this idea that in order to get out onto a golf course one needs to be able to play somewhat well. And, hello…it takes a most of us a couple of years of practice to play somewhat well. Thus many women and even me are discouraged early on because they feel like they’ll never get out onto a course. On top of all that women have so many things competting for their attention. Much more than men do. Christy: “I can speak from my experiences currently as mother and wife. Women have been programmed to be caretakers. Women have jobs outside of the house and inside the house. They have families to raise. Women are the ones who shuttle the kids to and from school and activites. They’re the ones who put dinner on the table and make sure the clothes are clean and ready to go. So when it’s time for a lady to take time out for herself…..it’s not usually at the golf course. Golf by design takes up a chunk of time. It’s time consuming to learn and play. On the weekends….it’s historically men who are out playing their morning round while a woman is occupied with the family. What could be done to encourage more women to play? Well, it was fun hearing the different perspectives on this topic. Thanks so much Aimee, Apryl, Patricia, Christy, Christine and Kevin! Your ideas were great. Introduce her to a good teacher who relates well to women and teaches all aspects of the game. Take her shopping for a good set of clubs, and of course, a great golf outfit (or 2 or 3). DON’T send her into Golftown alone! Help her set realistic goals. Make practice fun by meeting her on the range to hit a few balls before you head out for an evening. Take her to par 3’s to get her feet wet w/o the pressure or time of 18 holes, or playing with men who still think “golf is for boys – shopping is for girls”. Introduce her to other golf gals and schedule a weekly “9 and dine” during the summer with those ladies. She’ll not only have fun, she’ll make a lot more new friends. Encourage her to never give up! Be there for her when she’s ready to pack it in (we’ve all been there). When she’s ready for “the big 18”, play twilight golf when there are fewer “serious” golfers on the course. Keep it friendly and laugh a lot on the course. When she’s ready, pass the baton to her – i.e. Get her to encourage another girlfriend to play when your friend’s ready to be a mentor to her. Today only 23% of golfers in the USA are women (that’s about 7 million people). Can you imagine what would happen if even 10% of those women encouraged one more woman to play? And then what if those new players did the same thing the next year with their girlfriends? Continue that for 10 years and we’d would almost double the number of women in the sport. I realize it’s not easy, but as the old cliche goes, “Nothing worth having is ever easy”. Next week, I’ll draw upon the expertise of my “golf panel” to talk about women in golf forums. If you think there are few women in golf, you should check out the forums – They take GOLF very seriously. I am very happy to share that when I went to a course in the San Fernando Valley yesterday to play 18 I saw more women golfing then I had previously seen at the course. There was a twosome in front of my group, another woman in the group ahead of them, and several other groups that included women. In addition, two teen girls were taking lessons on the range. Love this kind of good news. Keep it coming! I’ve addressed this topic in the opening section of my book, Thumbs Down Golf Instruction Made Simple. The message is generic and geared for all golfers: men or women, young and old. “Even though the game of golf continues to gain in popularity, it’s not growing in size. Personally, I believe the average Joe (male or female) is tired of not improving quickly enough, like the commercials guarantee. Golf is a difficult game to play and it requires years of learning and practice to play it well. Equally as important, people by nature don’t like to do things at which they’re not good. I can only imagine how confusing it is for newer golfers to learn and understand the complex terminology I often hear”. As a golfer for over 40 years I still can’t relate to all the technical language that focuses too much on making the perfect swing. My eyes still glaze over with confusion, when experts on TV or in magazines try to keep it simple with detailed descriptions in a language only physics majors understand, not me. I draw a lot of comparisons to skiing, like the importance of learning the fundamentals first. Also, you don’t have to be good at it to enjoy doing it. The key is to match yourself up with others with similar skill levels on a simple course, like a par 3 until your ready to go to the next level. Last but not least, don’t worry about keeping score. Fun and enjoyability are no always measured by score. I am in my fourth year of playing golf. I have always played a competitive sport but I did take time out for me when I had to dedicate the time to having and taking care of my kids. They were teens when I started to play. Key to getting other women to play golf is to target other women who have never played. I know when I was playing my sport I had no desire to follow a little white ball around the course. It was only when I went looking for something physical to do that I started walking a 9 hole course for exercise, so I decided to teach myself golf. I am competitive my nature,so challenging my self each year to get better form the first year of not keeping score to the 20 handicap today with a goal to get below 90 this year. I might suggest golf events where a golfer invites a non golfer to play in some type of fun event to introduce them to the game. I volunteer for the Arizona Women’s Golf Association and we sponsor inexpensive 6 week golf lessons with a pro for beginners. Great program! It is true that it is a male dominated sport – move over guys! we ladies are now playing in your sandbox is what I say! Thanks Alan for letting me know about your book. I’ll check that out. I’ve been playing about 5 years and I still say to my husband that there is a little golfer inside of me just dying to get out :). It is a very hard game, but it is so rewarding as well. I started scoring in my 3rd year and now I do like to track my handicap to see if I am getting better. Thanks Gay! It’s great to hear you started playing later in life too, like me. So often women think they have to start young, but the beauty of golf is you can start at any age. Your 6 week program sounds great – we need more of those! I was drawn to pick up golf again as a middle aged women (I played as a kid) because I wanted an outlet for my sportsy/competitive side that I could pursue for the rest of my life. I’d love to see more active “mentoring” of women who are interested in playing. I spent my first summer golfing by myself! For a lot of people, that might be enough of a barrier that they’d never pursue the game. It wasn’t until I joined the EWGA that I found other women golfers and leagues . . . I wish there was an EWGA in Vancouver. I know I know, I should start one :), but I won’t do something unless I can give it 100%. But I want to know more about it and how it helps women. Let’s chat sometime about that. 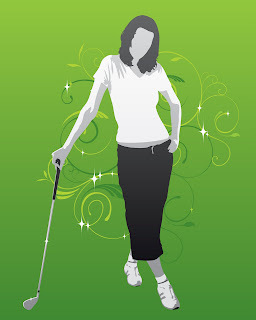 EWGA and Women on Course both create an inclusive environment for women who want to play. There are others in local markets. I think you’ll hear more about it going forward. I knew about EWGA, but not Women on Course. I’ll definitely check them out. Thanks Patricia! I see it, women (and girls) want to play golf, but they don’t want to be the only female there. We would see boys come down to the club, on their own, knowing there would be other boys to play with when they got there. But the girls would not come down on their own, for fear of there being no other girls to play with. So I recommend making sure there’d be a group of girls who will play golf and make sure they know about that, of course. I am happy to see more people talking about this issue. Alberta golf in Canada devoted a whole weekend to discuss this topic with over 100 women and professionals in this industry. As a women golfer who has chosen to make this a career (business side) I do want to help grow the game esspecially for women. These comments help show some issues and also help me to see I am not alone! Keep at it ladies and we can get more friends to come out! Gotta love Alberta 🙂 Being neighbours I have played golf with quite a few golfers from Alberta who vacation in our province. It was so nice to see husbands and wives enjoying the game together. If you ever get to Vancouver, let’s play 18!